Africa Investments – East Africa Investor Trip 2018 – CONVERGENCIUM LTD.
Investment is one of the best catalysers for the economic development of the African Nations. So we’re joining our forces with Africa Investments in order to bring the Rwandan companies the East Africa Investor Tour – aimed at matching international investors with Rwandan opportunities. 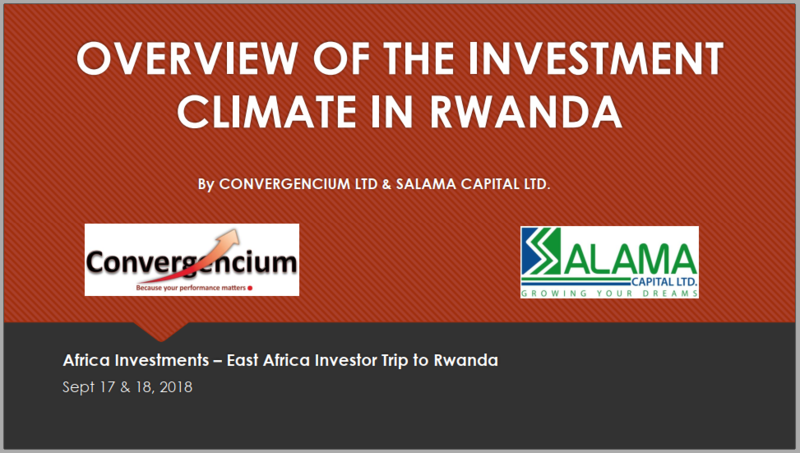 At this special event, we’ll be presenting, alongside our partner Salama Capital, an overview of the Rwandan Investment Climate to show where the opportunities are (in each every sector, in fact) and what to consider when investing. We’ll be happy to be with you at the Radisson Blu Hotel in Kigali!